In the wake of the launch of the iconic shelving concept ROYAL SYSTEM® in 1948, Poul Cadovius introduced the SYSTEM ULTRA® in 1957. The system was created on a very simple yet genius basic principle. It was developed with the same space-saving, flexible design as ROYAL SYSTEM®, based on the innovative idea of moving the furniture off the floor onto the walls, leaving more space in the room. SYSTEM ULTRA® consists of wall-mounted rails, shelves and hangers in powder coated steel. 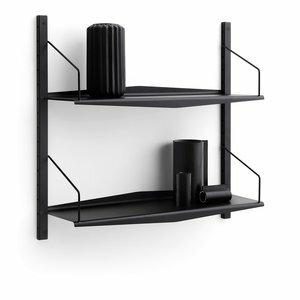 The system is characterized by its elegant, ultra-thin shelves, with a wave-shaped edge profile, attached to the rails by hangers in either raw brass or coloured steel. In 1957 Poul Cadovius exhibited at the XI Triennale in Milan with the SYSTEM ULTRA®, for which he won a silver medal. A highly treasured prize and an international recognition of an exceptional design idea. Home Made Stories picked the SYSTEM ULTRA A22 special: 4 color combinations packed in single boxes at special price. 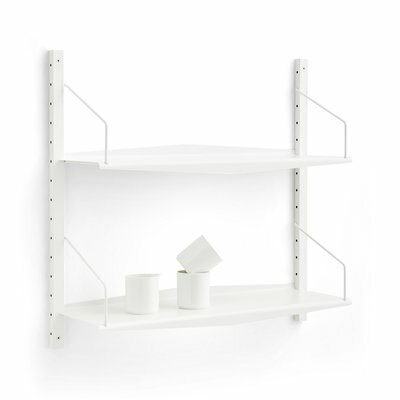 Consists of 2 rails H: 70 cm, 2 shelves D: 22 cm and 2 hangers.